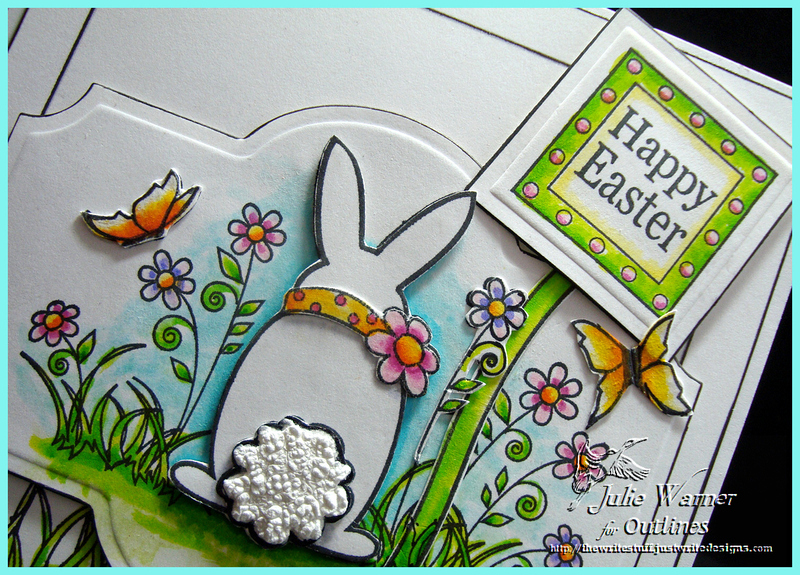 For my card, I stamped the Bunny Tails image twice, colored one w/ Tombow markers and die cut it w/ a Spellbinders labels 21. I cut out parts of the second image and popped them up on top of the base image to add a little dimension. On the bunny tail, I added a little white puffy paint. The greeting was die cut and I attached on top of a cut out flower stem. 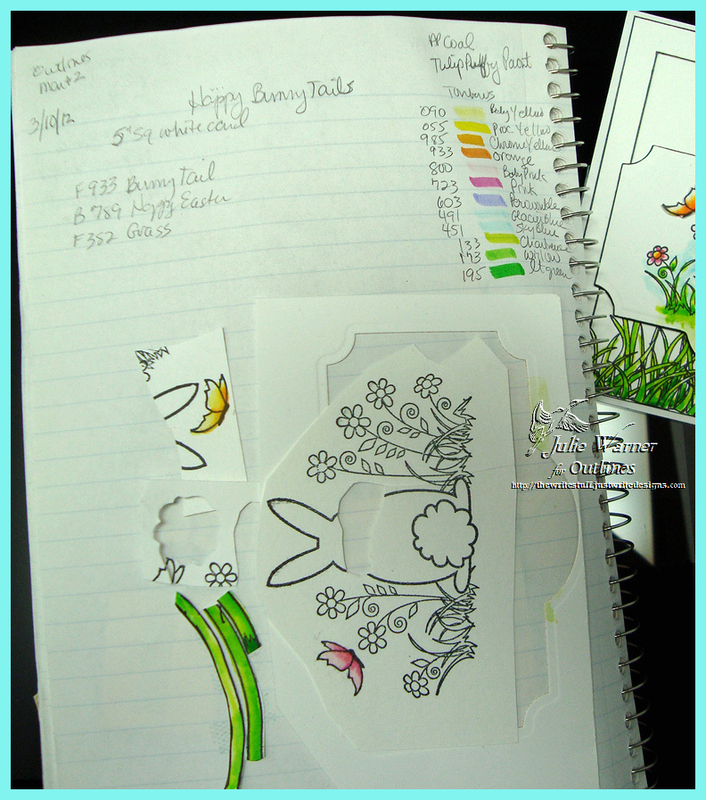 The grass border was stamped and colored on the larger layer and I used a black pen and ruler to draw the 3 sided frame. The finished card is 5 x 5. 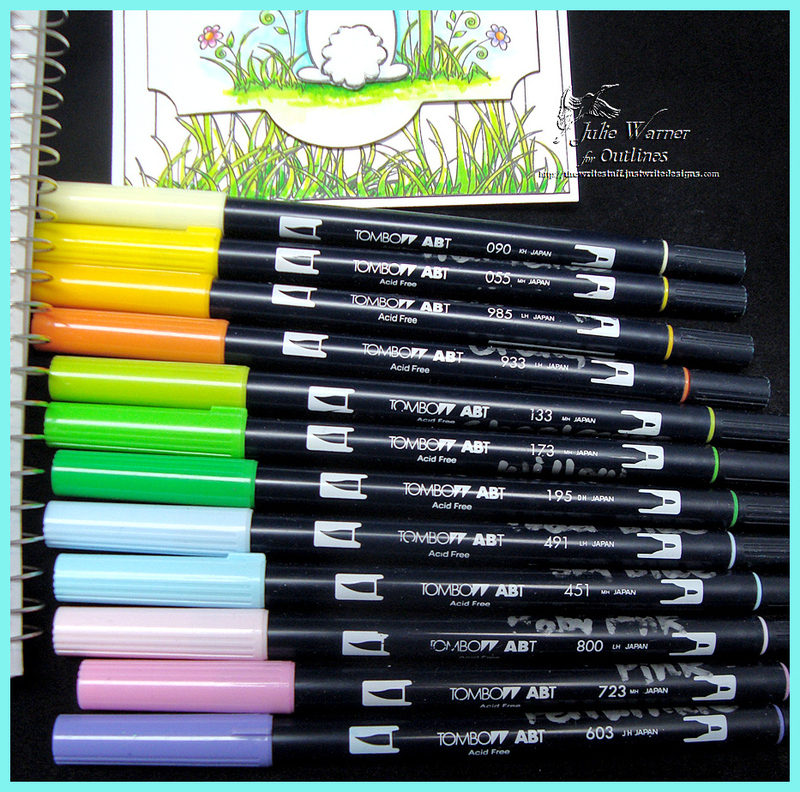 And here are the markers I used and my notebook. Thanks so much for stopping by! Please check out all of the team’s fabulous cards. Congrats to my friend and fellow DDIC Team member, Anne, who is the Featured Stamper today at Splitcoast Stampers! I had a fun stroll through her extensive gallery and finally picked Antique Moss to case. I liked the soft color and the way the frame reminded me of icing on one of those elaborate wedding cakes. That being said, it looks like I changed most everything. I changed the colors, the image, the layout. I did keep the texture and softness of the color. 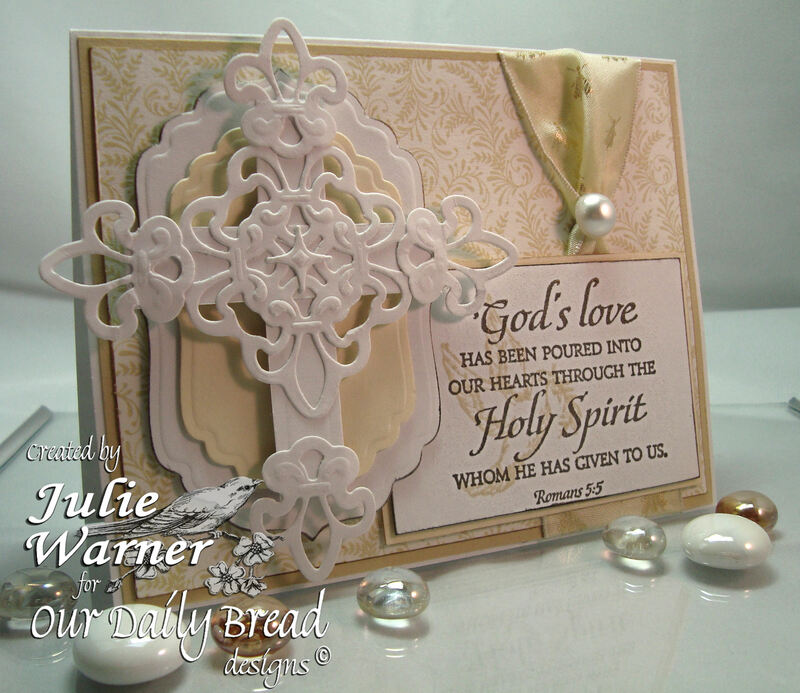 The scripture is a new image from Our Daily Bread designs in their Confirmation set. I stamped it w/ the lightning black ink and stamped the dove w/ the soft sand ink over it. If y’all saw the new Spellbinders dies last week, you would have seen a beautiful new cross die. Since I don’t have that fantastic die, I tried to create my own cross by putting pieces together. I started w/ a long rectangle die and resized it. Then I cut the middle section of the Fleur de lis die and four of the individual Fleur de lis and arranged them all as shown. I layered all the white w/ some vanilla, tan and dp. I added the ribbon and a pearl button w/ the shank removed. Thanks so much for stopping by! 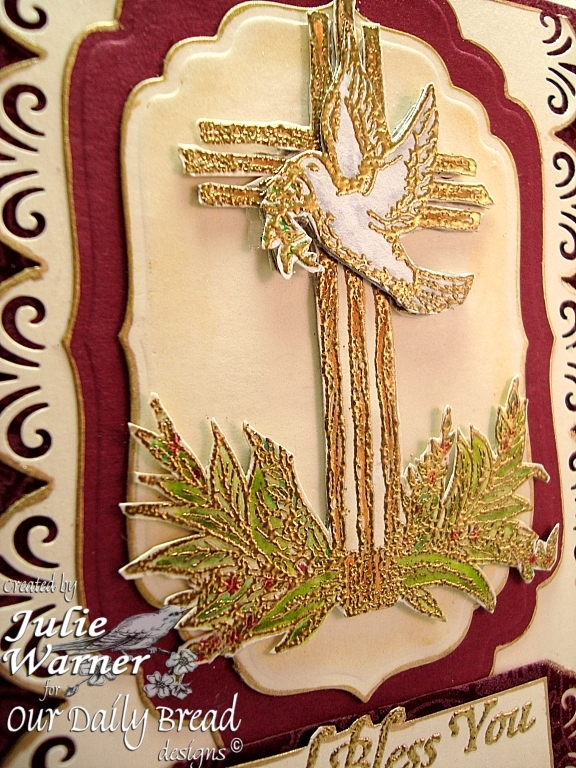 Our Daily Bread Designs Blog Hop 2010! 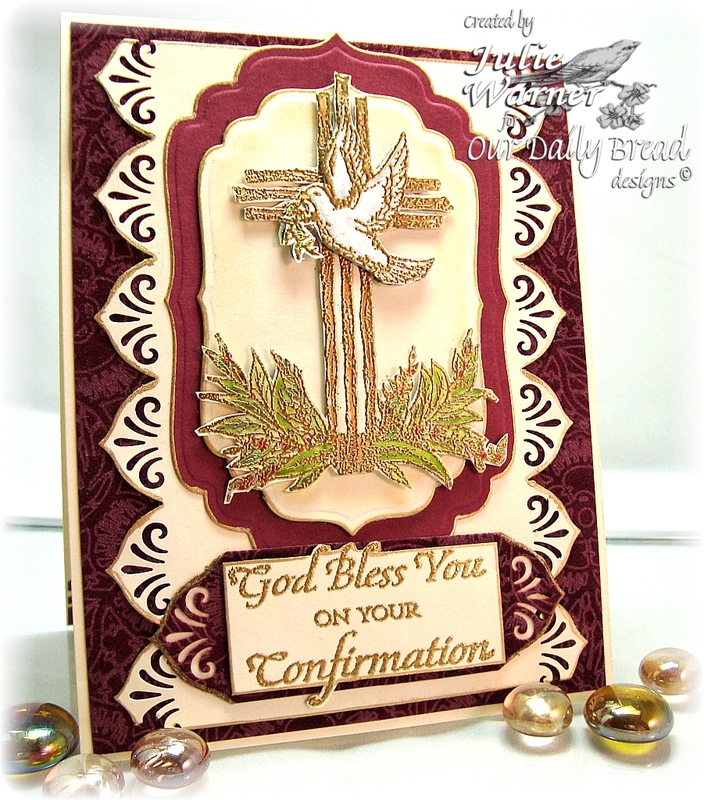 Welcome to the First Blog Hop of 2010 for Our Daily Bread Designs! If you got here from Debi’s blog, you are in the right place! 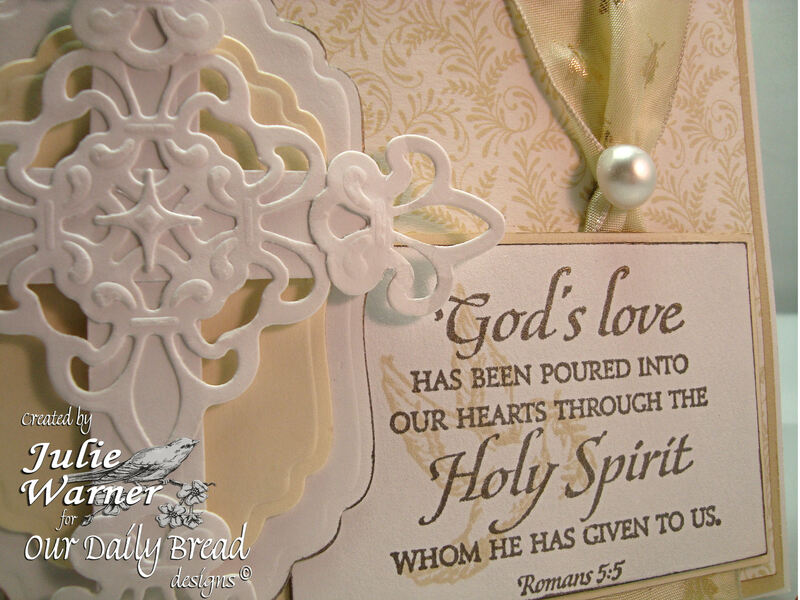 If not, you might want to go back to the Our Daily Bread Designs blog and start the hop from there! We are kicking off the new year with the release of three new sets,perfect for Baptisms, Confirmation, and New Baby cards! Three blessed hoppers will be chosen randomly to receive One Set of THEIR CHOICE! All you have to do to be eligible to win is complete the hop, leaving comments on each blog and returning to the ODBD Blog and leaving your answer to the question there by Monday, Jan. 4 at 8PM EST. The question will be posted on the ODBD blog, but here’s a tip.. as you are hopping along, take note of your favorite set and what you like best about them! Did I mention there will be THREE WINNERS?!! Please visit the ODBD Welcome Forum and leave a comment by January 10! If you do, you will be entered into a drawing to win a $50.00 Gift Certificate to the ODBD Store! We have a many things planned including Challenges and a special Prayer Request area! I hope to chat with you over on the ODBD Forum on SCS! Speaking of Challenges, we will be having a weekly challenge! The weekly challenge will be posted on the SCS Forum as well as the ODBD Blog. That means more prizes and awards, and fun for all!!! More on that shortly… stay tuned to the Our Daily Bread designs blog and the SCS Forum for further details. For now… just be sure to be back on Jan 9 when our first Challenge of the New Year will kick off! OK… now on to my card: I used the new ODBD Confirmation set. All the images were gold embossed and all panels were edged with a gold leafing pen. A little color was added to the image using markers and a blender pen. I used Spellbinders labels 4 to cut out my main panels and a border punch to punch down the sides of the ivory panel. I left the die in place and sponged on a little Brilliance gold ink. The beautiful background paper is from the Juliette collection from SEI. 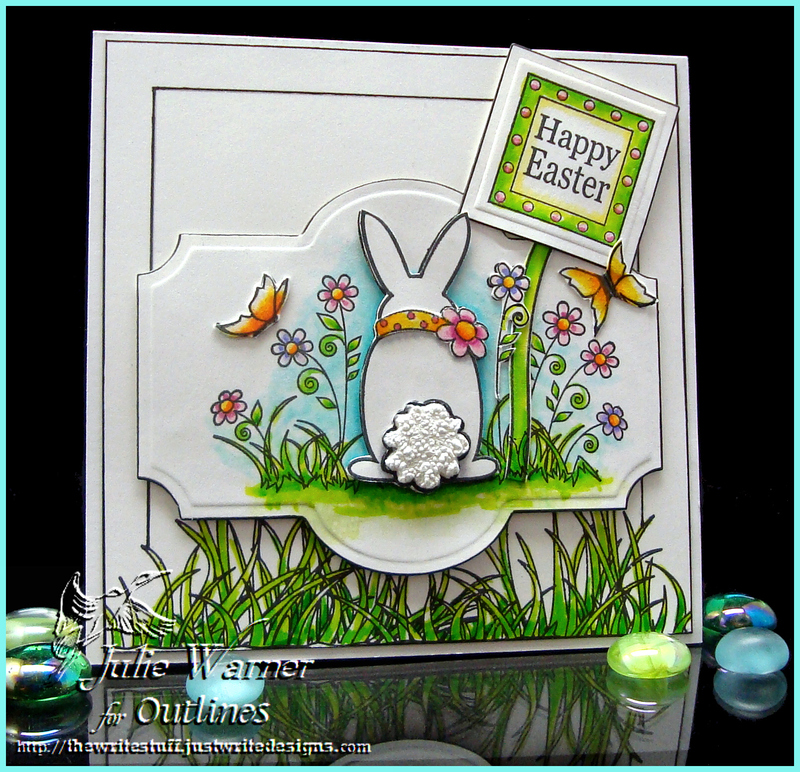 From here hop to Lorelie’s blog to see what great inspiration she has for you today!